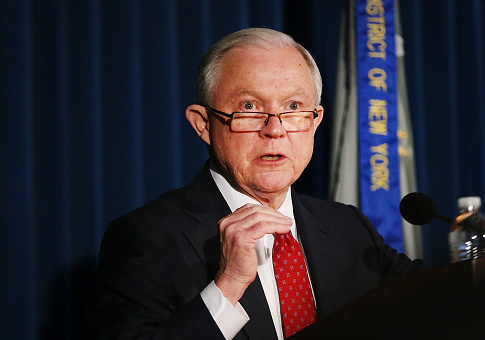 Attorney General Jeff Sessions announced a grand jury’s indictment of Jose Inez Garcia Zarate on Tuesday for being a felon in possession of a firearm and ammunition, and for doing so as an illegal alien. Last week, a California jury acquitted Zarate on murder charges in the 2015 killing of Kate Steinle in San Francisco, but convicted him of possessing a firearm as a felon. Now, he is facing federal firearm charges that carry a maximum penalty of ten years in prison. "According to the indictment, on July 1, 2015, Garcia-Zarate, a citizen of Mexico who reportedly is 47 years old, possessed a semi-automatic pistol and multiple rounds of ammunition in violation of 18 U.S.C. § 922(g)(1) (felon in possession of a firearm) and 18 U.S.C. § 922(g)(5) (unlawfully present alien in possession of a firearm)," a Justice Department statement reads. "Garcia-Zarate currently is in state custody on other charges," the statement adds. "If convicted of either violation of 18 U.S.C. § 922(g), Garcia-Zarate faces a maximum statutory penalty of 10 years in prison." Zarate had been deported five times before he was arrested for the death of Steinle in 2015. Steinle was shot in the back on July 1, 2015 on Pier 14 in San Francisco while she was was walking with her father and friend. Shortly before, Zarate had been released from jail where he was being held on drug charges, despite federal immigration authorities’ desire to detain him. A jury did not convict him of murder or manslaughter last week after his legal defense argued his shot ricocheted into Steinle unintentionally. The decision to release Zarate and subsequent death of Steinle provoked outrage from those critical of San Francisco's so-called sanctuary city policy on illegal immigrants. President Donald Trump criticized the California verdict acquitting Zarate on murder charges as "disgraceful." Prior to the latest indictment, Zarate was facing up to three years in prison for his firearm conviction in California. This entry was posted in Uncategorized and tagged California, Department of Justice, Illegal Immigration, Jeff Sessions, Trump Administration. Bookmark the permalink.